AV Installs Professional Standard Home Cinema Installation Service provides a low cost solution to wall mounting speakers, concealing speaker cables and configuring your home entertainment installation. AV Installs will take all the hassle out of setting up surround sound and connecting all the other devises, providing the reassurance that your system is set up correctly by our own in house expert audio visual engineers. The Standard Service is suitable for all modern day surround sound home entertainment system including 2.1, 3.2, 5.2, 7.1. AV Installs engineer will assess the room with the customer and decide where best to place the speakers for both performance and aesthetics. Once agreed the speakers will be wall mounted, any specialist fixings required will be supplied to provide a secure mounting of speaker enclosure, all speaker cables will be run back to the amplifier or receiver. Included in the home cinema installation Service is a complete cable management solution including D Line decorative trunking to contain the speaker cables as well as ties and cable spiral to make all the interconnecting leads behind the auxiliary equipment tangle free and tidy. The next step is to connect all the auxiliary devices to the home entrainment system. After the set up is completed and calibrated our engineer will be able to provide a complete demonstration of your equipment and answer any technical or operational questions that may arise. The Standard Home Cinema service is a fixed priced service, subject to a free of charge telephone questionnaire survey; we will then email an official quotation along with terms and conditions. All standard installations come complete with a full twelve month installation warranty and a customer satisfaction sign off sheet. AV Installs is a Northamptonshire Trading Standards Approved Buy With Confidence Member and only uses its own engineers which are CRB checked. AV Installs can also assemble any furniture that you may have purchased to house your auxiliary devises or we can also install floating AV shelves to house your equipment on or if you have speaker stands that need assembling. 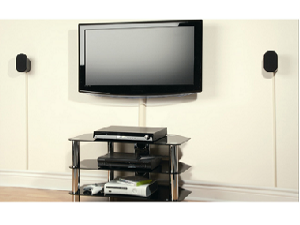 AV Installs supplies an extensive range of AV Furniture and Floating AV shelves units with cable management solutions. Above are some images of the Dline decorative mouldings that are used by AV Installs in the standard Home Cinema Installation Service, DLine moulding can be painted or stained to match existing schemes and are available in white, magnolia and wood effect. No matter what the floor or wall type AV Installs will provide the best Home Cinema cable management system available.